Home / Downloads / Videos CALL US AT 1-833-490-9727 TO GET YOUR QUOTATION READY IN MINUTES! The new technology of rotary ring machines are beginning to replace conventional arm and table wrappers. Rotary ring machines do not apply these wasted revolutions of film as the clamp and cut mechanism moves with the carriage. This simple difference results in tens of thousands of dollars in film savings, while allowing for faster and customized wrapping cycles. 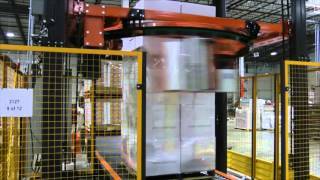 Watch our videos to learn more about our Rotary Ring Pallet Stretch Wrapper and how this technology is used in various industry packaging application. 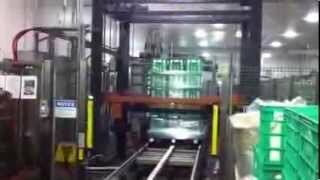 The video show the Rotary Ring Wrapper ability to start and stop the cycle anywhere on the load and how it can be used to perform specific wrapping cycles. Phoenix’s proprietary Automatic Rotary Ring stretch wrapper streamlines pallet wrapping operation and saves thousands each year on stretch film costs. 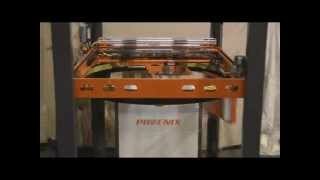 This video highlights the versatility, efficiency and speed of the Phoenix PRRA-2100 Rotary Ring stretch wrapper. Our proprietary Rotary Ring Automatic Wrapping Machine (the PRRA-2100) is shown here in our customer’s production facility. This particular client is a beverage distributor. 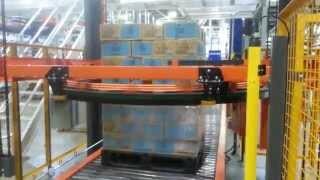 This client had existing automation (a palletizer and conveyor line) before incorporating our Rotary Ring automatic wrapping machine to the production line. Agriculture professionals aim to deliver the freshest fruits and vegetables while protecting their produce from any damaging impacts. To solve this problem Phoenix developed the Breathe Easy Film Slitter to provide a cost effective solution where air flow is required to help prevent condensation from building up under the film. 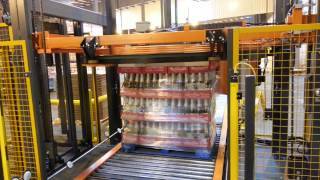 One of the most challenging stretch wrapping applications is pallets of empty PET bottles. Weighing as little as 200 pounds, but towering as high as 10 feet, the stretch wrapping machine has to secure the load, but with a light tension as to not crush the empty bottles. Using a rotary ring automatic stretch wrapper is the most efficient way to wrap different size of loads, like double or triple stacked, very high or short stacked loads that sometimes require different wrapping patterns. Being gentle doesn't mean being weak, the PRRA rotary ring series can easily handle some of the toughest packaging applications in the Industry. 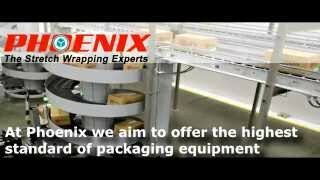 Phoenix Wrappers’ proprietary rotary ring stretch wrapper meets the needs of a high production warehouse. The PRRA-4000wraps up to 120 loads per hour at an incredible 40 RPM. It handily wraps pallets up to 48x50-inches. 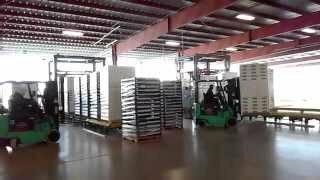 The video features a conveyorized rotary ring stretch wrapper located in one of our customer’s warehouses. 3 Axis Tab folding design provides maximum flexibility without damaging product. Ensures that the system locates the pallet, folds against the pallet edge and does not lift the top cap when retracting. Phoenix’s proprietary rotary ring technology allows the stretch film to be applied to the pallet with just enough tension to hold the load in place and protect it from the elements, while ensuring the force is not great enough to damage the product. The Phoenix Automatic Rotary Ring Stretch Wrapper is ideal for high-volume operations that run around the clock. 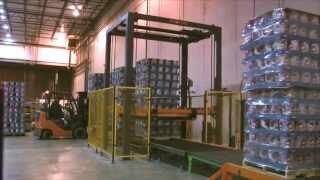 The video features a conveyorized rotary ring stretch wrapper located in one of our customer’s warehouses wrapping cases of fluid milk. Phoenix PRRA-4000 Rotary Ring Wrapper "Two Way Wrapping"
For applications that require tremendous amounts of load containment the double wrap cycle will start the cycle at the top with top wraps and then after spiraling down at a controlled overlapping speed it will apply the bottom wraps. Phoenix Integral Top Sheet Dispenser For PRRA System "Water Tight Cycle"
PRRA-4000 Rotary Ring stretch wrapper with integrated top sheet dispenser. The video demonstrate the PRRA-4000 performing a "Water Tight Cycle". 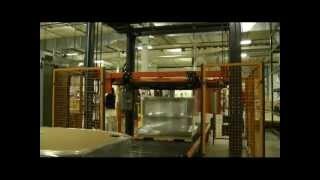 This video showcases the versatility of a Phoenix Rotary Ring automatic stretch wrap machine. While standard automatic stretch wrap machines require wrap cycles to begin and end at the bottom of the load, the rotary ring allows for highly customized wrap cycles to suit any type of load. Phoenix PRRA-4000 Rotary Ring Wrapper "Top Banding"
PRRA-4000 Rotary Ring stretch wrapper demonstrating "top banding" wrapping capability. In many applications the load does not require to be fully wrapped. For internal movement, local shipment and loads needing just top layer retention support, wrapping just the top layers of the pallet is enough to contain the load. The PRRA-4000 Rotary Ring stretch wrapper Cut & Wipe system welds the film tail to the previous layers of stretch film, thus positively securing the tail to the load. This is a standard built-in feature already included in the price at no extra cost! 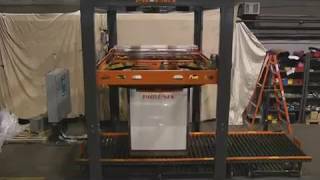 PRRA-4000 Rotary Ring stretch wrapper with integrated top sheet dispenser. The top sheet is dispensed automatically and prevent moisture, dust and dirt getting inside and contaminating goods. 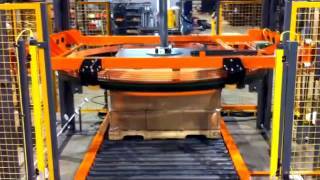 In the video, the PRRA-4000 Rotary Ring Wrapper at the customer production facility. For this application instance, the Phoenix PRRA-4000 Rotary Ring Wrapper was integrated with an existing palletizer and conveyor line. Check out also Phoenix Stretch Wrappers and Stretch Packaging Blog, Read the latest news about our Stretch Wrapping product and the Packaging Industry! In case you missed it - here is the link! We are currently expanding our distribution in North America and have openings in both Canada and the US. We are looking for Quality Stocking Distributors with Service capabilities.